Utorrent is definitely one of the smallest and best bit-torrent client for your windows PC . Although It might be the smallest bit-torrent client but it indeed packs a lot of useful features that most of us are not aware of . Utorrent is very efficient in downloading gigabytes and gigabytes of data, but depending on your internet connection’s speed , you might have to wait for a long time to download large files . Since most of us have other important works to deal with , it won’t be possible for everyone to wait for the downloads to complete in Utorrent and then shut down their PC . In a situation like this, you can make use of a very useful features in Utorrent . Which is Utorrent’s ability to automatically shutdown your computer after all the downloads are completed . Not only the automatic shutdown feature of utorrent will allow you to focus on your other important works , at the same time it will also help you to reduce your electricity bill . Here is how you can set Utorrent to shut down your computer automatically when your downloads complete . 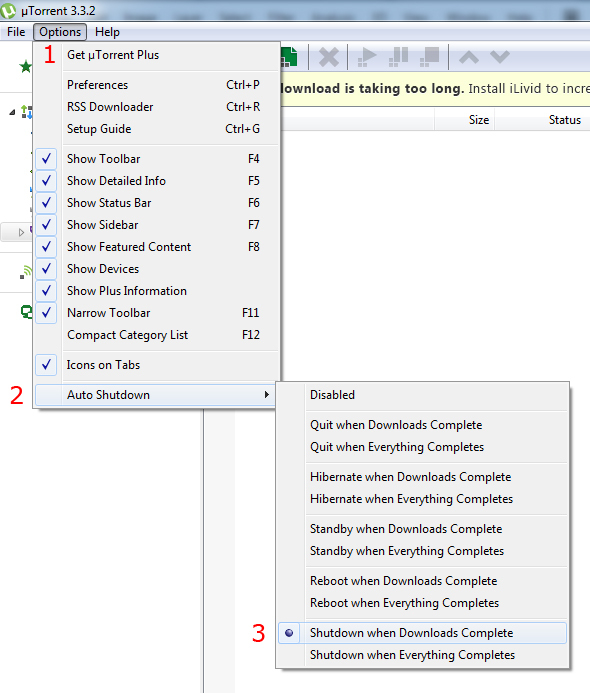 To set the automatic shutdown , simply click on Utorrent’s settings and select Auto Shutdown > Shutdown when Downloads Complete . Its as simple as that and now when all the downloads are completed , Utorrent will automatically shutdown your computer . Apart from that you can even choose from other options like reboot , hibernate and standby also . Given that , Utorrent is a very small software, most people don’t even bother to explore the many useful features in this program . Starting from creating a torrent to controlling utorrent through a browser and even many more . Utorrent has a lot of handy features , which are something that you need to be well versed with to make the most of this handy little bit-torrent client .